I wrote this book because I fell in love with a story. The story concerned a small group of undervalued professional baseball players and executives, many of whom had been rejected as unfit for the big leagues, who had turned themselves into one of the most successful franchises in Major League Baseball. But the idea for the book came well before I had good reason to write it-before I had a story to fall in love with. It began, really, with an innocent question: how did one of the poorest teams in baseball, the Oakland Athletics, win so many games? With these words Michael Lewis launches us into the funniest, smartest, and most contrarian book since, well, since Liar’s Poker. Moneyball is a quest for something as elusive as the Holy Grail, something that money apparently can’t buy: the secret of success in baseball. The logical places to look would be the front offices of major league teams, and the dugouts, perhaps even in the minds of the players themselves. 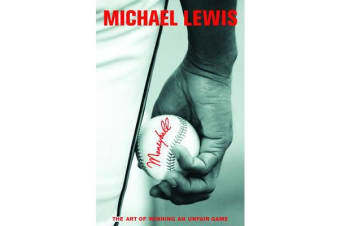 Lewis mines all these possibilities-his intimate and original portraits of big league ballplayers are alone worth the price of admission-but the real jackpot is a cache of numbers-numbers!-collected over the years by a strange brotherhood of amateur baseball enthusiasts: software engineers, statisticians, Wall Street analysts, lawyers and physics professors. What these geek numbers show-no, prove-is that the traditional yardsticks of success for players and teams are fatally flawed. Even the box score misleads us by ignoring the crucial importance of the humble base-on-balls. This information has been around for years, and nobody inside Major League Baseball paid it any mind. And then came Billy Beane, General Manager of the Oakland Athletics. Billy paid attention to those numbers -with the second lowest payroll in baseball at his disposal he had to-and this book records his astonishing experiment in finding and fielding a team that nobody else wanted. Moneyball is a roller coaster ride: before the 2002 season opens, Oakland must relinquish its three most prominent (and expensive) players, is written off by just about everyone, and then comes roaring back to challenge the American League record for consecutive wins. In a narrative full of fabulous characters and brilliant excursions into the unexpected, Michael Lewis shows us how and why the new baseball knowledge works. He also sets up a sly and hilarious morality tale: Big Money, like Goliath, is always supposed to win… how can we not cheer for David?